'Rahat Lakoum' is better known in the western world as Turkish Delight, a gelatinous sweet originally imported to Britain as a dessert. The Victorian era was probably the apogee of the British empire's reach and influence; it was also a new high point in trade with other empires and nations, and of immigration from Europe and beyond. 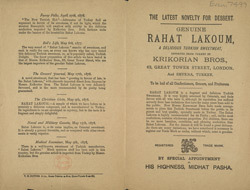 Along with clothes, food such as Rahat Lakoum was one of the ways that lower and middle class British people could experience foreign cultures. This leaflet contains testimonials asserting the "pleasant and enjoyable" taste of the dessert.